Today, we will start explaining the Generator Sizing Calculations. 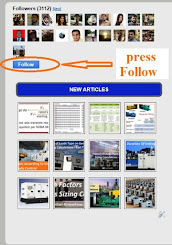 These articles will explain the design of stationary generators. They will not cover the design of stationary–designed commercial generators used as mobile generators, which are generally considered to be an unintended application. Lighting: Egress lighting for evacuation, illuminated exit signs, security lighting, warning lights, operating room lighting, elevator car lighting, generator room lighting, etc. Control Power: Control power for boilers, air compressors, and other equipment with critical functions. Transportation: Elevators for fire department use. Mechanical Systems: Smoke control and pressurization fans, waste water treatment, etc. Refrigeration: Blood banks, food storage, etc. Production: Critical process power for laboratories, pharmaceutical production processes, etc. Space Conditioning: Cooling for computer equipment rooms, cooling and heating for vulnerable people, ventilation of hazardous atmospheres, ventilation of pollutants or biological contamination, etc. Data Processing: UPS systems and cooling to prevent data loss, memory loss, program corruption. Life Support: Hospitals, nursing homes, and other health care facilities. Communications Systems: 911 service, police and fire stations, hi–rise building public address systems, etc. Signal Systems: Railroad, ship, and air traffic control. International Electrotechnical Committee: Standard for Rotating Electrical Machines, Part 1 (Rating and Performance), IEC 34–1. International Standards Organization: Standard for Reciprocating Internal Combustion Engine Driven Alternating Current Generator Sets, Parts 1 through 9, ISO 8528. National Electrical Manufacturer’s Association: Standard for Motors and Generators, NEMA MG1–1. Canadian Standards Association: CSA 22, Canadian Electrical Code. CSA 282, Emergency Electrical Power Supply for Buildings. Underwriters Laboratories: UL 2200 Stationary Engine Generator Assemblies. This is an industry standard that defines the performance parameters required in various onsite power applications. Most manufacturers follow the ratings detailed in ISO-8528-1. However, some manufacturers have slight exceptions to these ratings in order to best fit their customer requirements, performance capabilities, or maintenance schedules. The U.S. Environmental Protection Agency has environmental ratings and regulations for generator sets that vary by drive-engine horsepower and application. Uptime Institute has set design standards for data centers, with the intention that data centers are designed with similar practices to ensure data safety. The proper understanding of the standards will ensure the best rating selection for the purpose the generator set serves, which is the basic foundation to customer satisfaction. Power ratings for generator sets are based on fuel stop power in accordance with ISO 3046/1, AS 2789, DIN 6271 and BS 5514. The fuel stop power is fixed for each engine model/configuration. It represents the maximum safe horsepower the engine model/configuration will be able to produce without exceeding the limits set according to the parameters. They are published by the manufacturers. It is further defined as the output available with varying load for the duration of the interruption of the normal source of power. 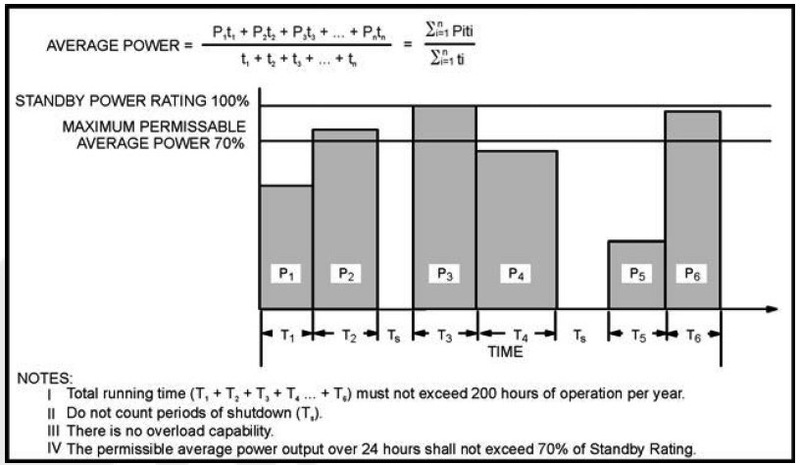 This rating is only applicable to variable loads with an average power output of 70 percent of the standby rating over 24 hours of operation for a maximum of 200 hours of operation per year. In installations where operation will likely exceed these limits, the prime power rating should be applied. 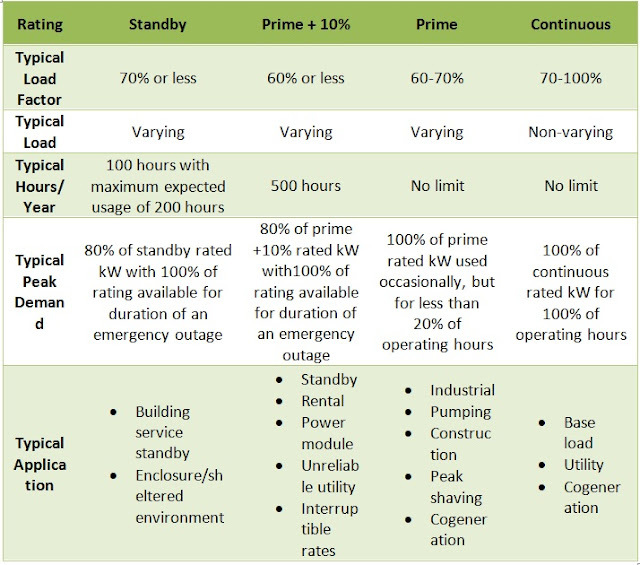 The standby rating is only applicable to emergency and standby applications where the generator set serves as the back up to the normal utility source. No sustained overload capability is available for this rating (Equivalent to Fuel Stop Power in accordance with ISO3046, AS2789, DIN6271 and BS5514 as well as emergency standby power (ESP) per ISO 8528). 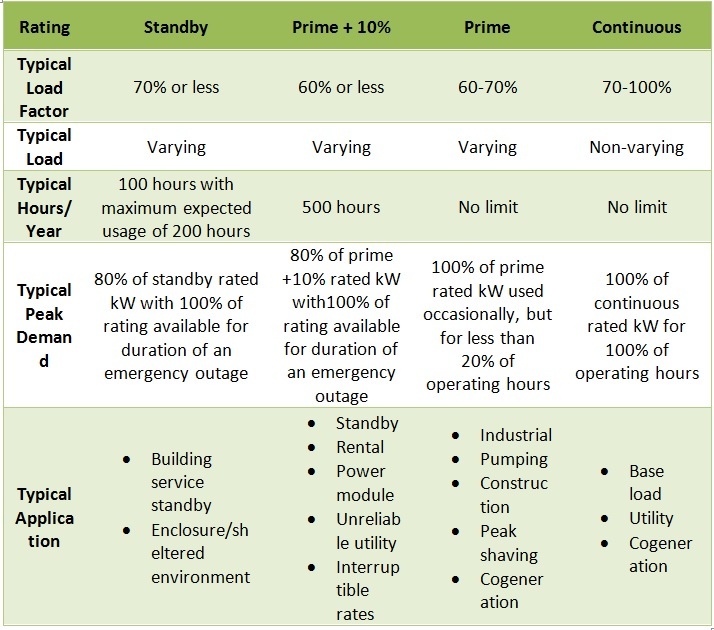 No sustained utility parallel operation is permitted with this rating. 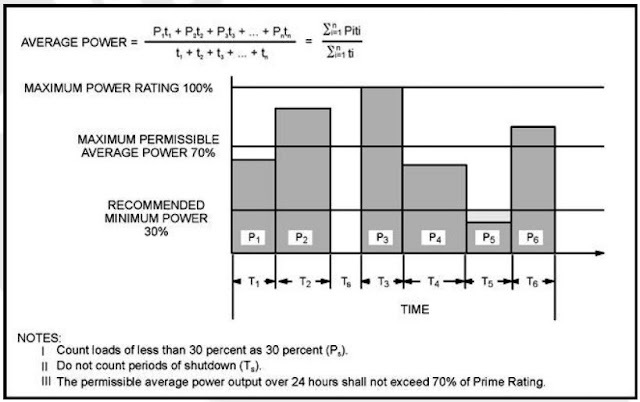 For applications requiring sustained utility parallel operation, the prime power or base load rating must be utilized. Prime power is available for an unlimited number of annual operating hours in variable load applications. 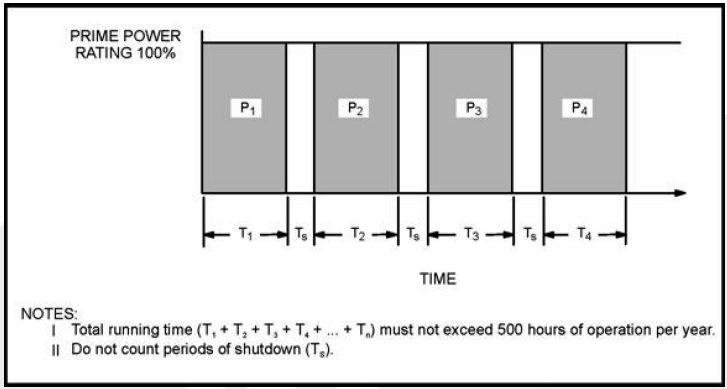 Applications requiring any utility parallel operation at constant load are subject to running time limitations. 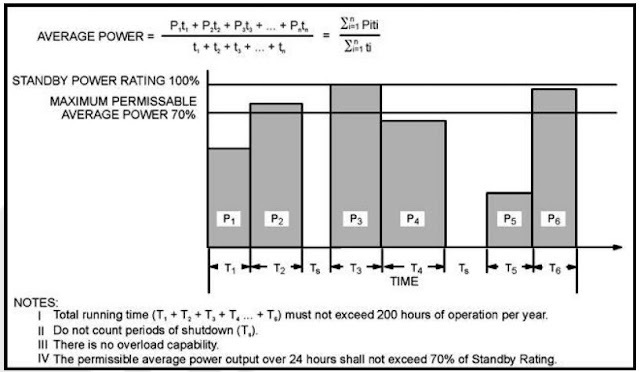 In variable load applications, the average load factor should not exceed 70 percent of the Prime Power Rating. Prime power is available for a limited number of annual operating hours in constant load applications such as interruptible, load curtailment, peak shaving and other applications that normally involve utility parallel operation. The total operating time at limited running time prime power must not exceed 500 hours per year. Generator sets may operate in parallel with the utility source up to 500 hours per year at power levels not to exceed the Prime Power Rating. Any application requiring more than 500 hours of operation per year at the Prime Power Rating should use the Base Load Power Rating. Continuous-rated gen sets are sized to operate at 70 to 100 percent of maximum load that is non-varying and has no hour-use limit. Typical peak demand is 100 percent of continuous rated kW for 100 percent of the time. These are determined in accordance with ISO 8528 as well as ISO 3046/1, AS 2789, DIN 6271 and BS 5514. Typically, this rating is used when the units are being operated in parallel with the utility and the output will remain constant, such as a cogeneration application. No sustained overload capability is available at this rating. The application of On–site power generation systems can be determined by system type and generator set rating. Emergency systems are generally installed as required for public safety and mandated by law. They are typically intended to provide power and lighting for short periods of time for three purposes: to permit safe evacuation of buildings, for life support and critical equipment for vulnerable people, or for critical communications systems and facilities used for public safety. Code requirements typically specify the minimum load equipment to be served. Legally–required standby systems are generally installed as mandated by legal requirements for public safety. These systems are typically intended to provide power and lighting for short periods of time where necessary to prevent hazards or to facilitate fire–fighting operations. Code requirements typically specify the minimum load equipment to be served. Optional Standby systems are generally installed where safety is not at stake, but loss of power could cause an economic loss of business or revenue, interrupt a critical process, or cause an inconvenience or discomfort. These systems are typically installed in data centers, farms, commercial and industrial buildings, and residences. 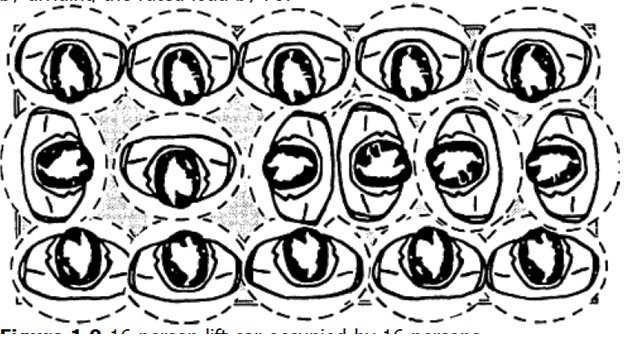 The owner of the system is permitted to select the loads connected to the system. In addition to providing a standby source of power in case of loss of a normal power supply, on–site generation systems are also used for the following purposes. Prime power installations use on–site generation in lieu of a utility electricity supply, typically where utility power is not available. A simple prime power system uses at least two generator sets and a transfer switch to transfer supply to the loads between them. One or the other of the generator sets runs continuously with a variable load, and the second generator set serves as backup in case of a failure, and to allow downtime for required maintenance. A changeover clock within the transfer switch alternates the lead generator set on a predetermined interval. Peak shaving installations use on–site generation to reduce or flatten peak electricity use for the purpose of saving money on energy demand charges. Peak shaving systems require a controller that starts and runs the on–site generator at the appropriate times to flatten the user’s peak demands. Generation installed for standby purposes may also be used for peak shaving. Rate curtailment installations use on–site generation in accordance with electric energy rate agreements with the serving electric utility. In exchange for favorable energy rates the user agrees to run the generators and assume a specified amount of load (kW) at times determined by the utility, typically not to exceed a specified number of hours per year. Generation installed for standby purposes may also be used for rate curtailment. Continuous base load installations use on–site generation to supply a constant power (kW) typically through interconnection equipment into a utility grid. These installations are usually owned by electric utilities or under their control. Co–Gen is utilizing both the direct electricity generation and waste exhaust heat to substitute for utility supplied energy. The waste heat is captured and either used directly or converted to electricity.